Yesterday it was announced that Style Me Pretty is shutting down and will be completely taken offline at the end of April. This decision was made by their parent company, Oath (owned by Verizon), and had nothing to do with how the site was run. With the announcement came a lot of speculation, both about Style Me Pretty, and the wedding industry at large. Weddings are a $298 billion annual business globally and a feeder industry to lifelong customers for other industries, including travel, hospitality, and retail. Even with the numbers, it is difficult to convince people who are not immersed in the business of weddings day-in and day-out that they matter from an economic standpoint. A corporation’s decision to close one of their dozens of verticals is indicative of their corporate goals, not the state of the wedding industry. My personal opinion is that people should stop making baseless assumptions about Style Me Pretty itself, especially out loud on social media. The editors behind it are real people who abruptly lost a job they loved this week, and expressing schadenfreude is gross. The kooky conspiracy theories people are starting to spread aren’t helping anyone. Second, the closure is not an indictment of the wedding industry or anything anyone is or was “doing wrong.” Over half of the wedding businesses operating today were started in 2010 or after, which means that many people in the industry don't have a long-term memory of how wedding marketing has evolved or what it took to get a business noticed before. In the late 90s, The Knot changed how weddings were marketed by bringing them online. A listing with The Knot was the industry’s first introduction to online vendor directories, and the work their sales people put in convincing people that advertising online could be profitable opened the doors for blogs to offer advertising later on with a built-in base of wedding professionals who already knew it could work. DIY Bride was the first national wedding blog, followed by Offbeat Bride. Both Khris and Ariel paved the way for blogs to turn into full media companies, with book and product deals. Style Me Pretty followed in this path early on and did it well. These sites were the first to truly level the playing field when it came to a wedding pro’s ability to get published. Back when exposure was limited to almost solely print magazines, people had to spend double or triple their mortgage payment every month on publicists, with no guarantees they would make it into a magazine’s limited print space. A blog’s ability to publish new content every day, multiple times a day, added not just to a wedding pro’s options for getting published, but also to the places engaged couples could turn to for information. While it will always be in fashion to complain about the younger generations, the fact of the matter is that millennial and Gen Z consumers do their homework. Today’s couples read both print magazines and online blogs. They are on Instagram, Snapchat, and yes, Twitter (Gen Z uses Twitter more than millennials, Gen X, and Boomers do, with many tweeting over 100 times a day). As savvy shoppers who are afraid of falling prey to the so-called “wedding industrial complex,” they Google everything and everyone involved in their wedding as well as the wholesale cost of any goods they’ll be purchasing. The loss of Style Me Pretty is a significant loss to the industry, both emotionally as it helped many people launch their careers, and as an archive of amazing creative work wedding pros have done over the past 11 years. The loss, however, does NOT mean that blogs and social media are irrelevant, even if you are personally tired of them. It does not mean that everyone is going to shift all of their ad dollars back to print. It does not mean your SEO is going to suffer. It also does not mean that the wedding industry is dying. The U.S. wedding industry specifically goes through a dip in bookings and sales every time there is a new president, no matter who that president is. Change makes people nervous, and while this may be frustrating for business, it is human nature and something we all need to learn how to work with rather than fruitlessly fight against. This same presidential-transition dip in wedding sales happened in 2008, but because the recession was happening at the same time, that got all the attention and most of the blame. It also happened in 2000, and in 1992 (though that one was largely blamed on a recession as well). The top reasons for shifts in the business of weddings are always connected to forces outside the industry. Always have been, always will. You don't have to enjoy economics, technology, or politics, but paying attention to these things will help you better navigate consumer changes. People are still getting married, and will continue to. People are still spending on weddings, and will continue to. People are still using the Internet and social media to plan their weddings, and will continue to. Marketing your wedding business in today’s world means working smarter and harder. Evolve and diversify as needed, but go easy on the Chicken-Little-sky-is-falling blame game. It is almost always misplaced. Do Weddings Fuel Needless Consumerism? Note from Liene: I wrote this post six years ago, after the royal wedding of Kate and Wills. I'm reposting it today because while the context of this conversation has changed a bit, the subject of the conversation is the same. With the popularity of Instagram, Snapchat, Pinterest, and now Facebook Live and Instagram Live Stories, visual social media consumption is at an all-time high. The argument of whether or not weddings fuel a pressure to throw a perfect event, or enable a "keeping up with the Joneses" mentality and needless consumerism is being hotly debated once again. Two weeks ago, I wrote about Newsweek's cover of the royal wedding and my opinion that the royal wedding was a light, but not shallow, break from a world filled with heavy news. It surprised me when this turned out to be my most controversial post to date (a post along the lines of "what the f*&! is this woman thinking?!" was reblogged on Tumblr over a thousand times). I don't mind if people disagree with my opinions, and the counter-arguments do raise some interesting – though not new – questions: Do weddings fuel needless consumerism? Have weddings become nothing more than an endless parade of gluttony and a chance to show off just how well one has kept up with the Joneses? These questions present a tension that I believe is healthy. It is a tension that has always been on my mind throughout my career in the wedding industry. Prior to weddings, I was in international development. I’ve lived and worked in developing nations, in areas of extreme poverty, and when you’ve seen, firsthand, people living without the very basics in life (food, water, shelter, clothing), it can be really difficult to take a bride seriously when she’s stressing out over a precise shade of pink in her five- or six-figure flower budget. Because of this, It can also be really easy to fall into a pattern of thinking, “How can you possibly spend that amount on XYZ, don’t you know how many lives that could save?” This pattern of thinking is toxic. Make no mistake: being a spending martyr is no better than being a glutton. Neither nagging about nor ignoring real issues is a good solution. This is not to say that I think weddings are, by default, superficial or materialistic. I’ve also had the great pleasure of working with people who understand what a wedding is really about. I love weddings because they are – at their core – a celebration of people. They celebrate the couple, their love, and their decision to go through life together, thick and thin. They also celebrate every single guest in the room. Weddings are a way of honoring the people who helped shape a bride or groom into the person the other fell in love with. There is nothing shallow about celebrating love, whether it's the love between a couple, the love between a family, or the love between friends. I share this story often when I speak: one of the main reasons I went into business for myself was because I wanted to be able to fund the humanitarian projects I’m passionate about (namely related to orphan care, HIV/AIDS, and issues of extreme poverty). I began my career at a nonprofit that worked with social justice issues, and it is something I am deeply passionate about. Years ago, I watched a 60 Minutes piece about a plastic surgeon who worked six months out of the year at his posh practice in the United States and then spent the other half of the year in Sierra Leone performing free reconstructive surgeries on children whose faces and bodies had been mutilated by warlords. When I started my business, I decided I wanted to model it in a similar fashion: be able to have the time to work with the issues I'm passionate about, whether at home or abroad, and make enough money to be able to fund my lifestyle as well as the nonprofit work. This goal shapes every decision I make with my business. It is the reason I chose to structure and grow my company the way I did. It is an aggressive goal, and so I developed a plan with an aggressive pace. One of the reasons I chose the wedding industry was because I knew it was largely an industry of right priorities and that it wouldn’t crush my soul in the process. The needs of the world can be overwhelming, so you have to choose what you’re personally passionate about and do what you can in those areas. No one can do everything, and fortunately, no one is expected to do everything. Working to eradicate poverty, or feeding the homeless, or championing cancer or autism research doesn’t negate the need to also celebrate the joys of life. People have a right to live fully, not just merely. If someone is a materialistic, shallow person, then it makes sense that the focus of their wedding would be materialistic and shallow. Having a beautiful ceremony or reception and a big celebration does not necessarily equal superficiality and all weddings shouldn't be painted with broad strokes of a black and white, cynical brush. Luxury or high-end doesn’t necessarily equal shallow. Shallow equals shallow and it comes in every tax bracket. 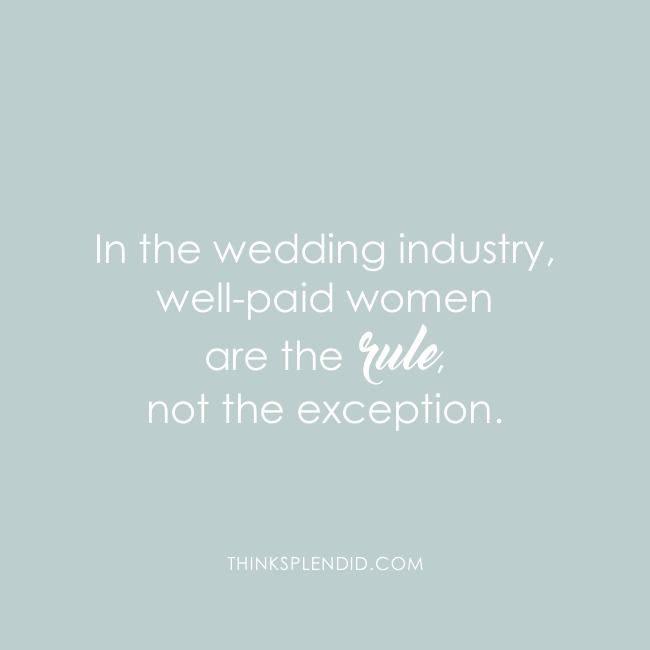 In the wedding industry, well-paid women are the rule, not the exception. In the wedding industry, we don't have to fight to find female speakers for conferences. While the tech industry is currently trying to shift away from "manels" (where speaking panels are made up of all men), we don't have that problem. In the wedding industry, company boards of directors have an equal number of women, if not more women than men. In the wedding industry, we get to work alongside creative professionals from all walks of life who bring with them varying perspectives and cultural habits. In the wedding industry, artists don't have to starve. People have had celebrations across every socio-economic segment, in every culture, since the beginning of time. They always will. We get paid to help people celebrate some of life's most memorable occasions. We are the lucky ones.